THE HEARTBROKEN family of a Sri Lankan student stabbed to death on his last shift as a pizza delivery man in Sheffield say they will “never get over” his death, as two men prepare to be sentenced for his murder today. 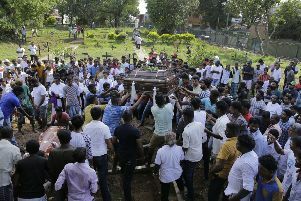 Thavisha Lakindu Peiris’ parents, father Sarath and mother Vajira, have paid tribute to the “caring and loving” son who went to Britain to study for a better life, but had his life cruelly cut short by armed robbers. It comes after a jury at Sheffield Crown Court found Shamraze Khan, 25, guilty of the 25-year-old’s murder. Kasim Ahmed, 18, had pleaded guilty at a previous hearing. The two-week trial heard how the pair subjected Mr Peiris to a “frenzied” knife attack after attempting to steal his mobile phone in the Southey Green area of the city in October last year. Earlier that day they had carried out two robberies at knifepoint in the Castle Market area of the city. They left the Sheffield Hallam University graduate, who was carrying his final shift as a Domino’s delivery driver before beginning his dream job in IT, bleeding to death in his car. In a statement released following the guilty verdict, Mr and Mrs Peiris said: “Thavisha was the centre of our world and we will never get over losing him. “He gave us so many reasons to smile and was so caring and loving. All we have left are our memories, but they will never fill the void in our hearts. He will never again be with us and we will never hear his voice again. “We sent our son to the UK to study so he could have a better life; we never thought he would be in any danger. “He was such a kind and considerate man, always full of life and always with a smile on his face, anyone who met him immediately like him,” they said. But it was his work ethic and ambition for which many remember him and, in a terrible twist of fate, ultimately led to his life being taken away. Mr Peiris took a three-year IT course at the Sri Lanka Institute of Information Technology and completed his third year in Sheffield, graduating in 2011. He had worked at Domino’s to fund his study, but had announced his departure after landing a role as an IT consultant. Previous reports said Mr Peiris had complained of feeling ill on the night of his death but agreed to do one more delivery, on which he encountered his killers. “We were extremely proud of Thavisha’s achievements and we were so happy that he was doing so well in England,” his family said. Mr Peiris’ parents and brother Pramod, who had also planned to study in the UK, went on to thank South Yorkshire Police for their work and the public and media for helping to catch the killers. Khan, of Southey Crescent, Sheffield, and Ahmed, of Darnall, Sheffield, will be sentenced for murder and robbery offences at Sheffield Crown Court today. Mr Peiris’ family also thanked South Yorkshire Police and the public for helping to catch the killers.